A New Dawn for Afghanistan? Despite political uncertainty, a new optimism is becoming evident among the people of Afghanistan. When I met Haidi Amanullah in Kabul last year he was planning to wind up his business and relocate to a safer place, either India or Canada. He had already sold one of his two houses and was seeking a buyer for the second. Like some of his friends, he was all set to seek asylum in a third country, fearing for his future in the country of his birth. So it was a surprise to see him again in Kabul almost a year later. Busy dusting his dry fruit shop in the Shahr-E-Naw district of the capital Kabul, Amanullah presents a different face. Gone was the worried, downcast look; on this day, he exudes a new confidence and temperament. “I know you are surprised or rather shocked to see me here again. I also don’t believe that I am still in Kabul. The mood has changed in this country. Don’t you sense a new kind of feeling sweeping the country?” asks the 31-year-old shopkeeper when I meet him two days after the April 5 elections. He is not the only one expressing this sentiment today, unprecedented though it might be for the war-torn country. After three years in India, Hamid and his wife Ameena returned to Kabul in February this year and resumed their professional careers. When they were last in Afghanistan, Ameena’s activism in support of women’s rights had invited threats from fundamentalists. In 2010, she survived an attack by the Taliban but was forced to flee to Delhi with her husband. Instead of living a life in hiding she decided to return home and piece their lives back together. This feeling of change is evident almost everywhere one goes in Afghanistan. The very fact that voter turnout was so high, at about 60 percent, despite threats from the Taliban underscores the desire Afghans have to alter the discourse in their country. “How long one can live in fear of the Taliban? The violence and uncertainty has taken a toll on Afghanistan. The new generation who is exposed to the world outside want to see their country in the same way. They want to feel proud of their country,” explains Hameed, a journalist working with a radio station in Herat. Masuma, a tour guide in Bamiyan, feels the same way. This 22-year-old graduate has received professional training as a tour guide and wants to earn living by showing visitors the wonders of Bamiyan. “You know, I stood three hours in a queue to cast my vote. My vote was both a vote for change and a vote against the Taliban. Bamiyan does not need any other industry, tourism is enough for the people of this region to prosper. 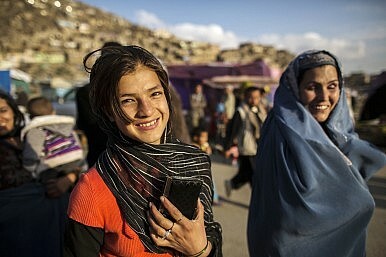 For that to happen peace is mandatory and I hope the new president will usher in a new era in Afghanistan,” she says. Nonetheless, Afghanistan watchers remain cautious. The feeling is that the change in Afghan public attitudes has been remarkable but uncertainty remains. “I think what has happened in Afghanistan is remarkable but it fundamentally does not address the problems facing the country. You have to wait and see what happens when the whole electoral process is completed,” observes Martine van Bijlert, a fellow at Afghanistan Analysts Network, a Kabul-based think tank. Indeed, there has been a relative lull in the activities of the armed opposition after the elections. No doubt heightened security is one reason but analysts point also to a change in public attitudes towards the Taliban. “Times have changed. People in Afghanistan are aware of social media, they interact on these sites and spread information. Television has reached almost every household and political debates serve to inform people. In this new age it is no longer possible to get by on simple medieval thinking. The aspirational class wants a new deal, a new life in their country and they are very vocal about it,” says Sajad Urya, one of the senior editors of the English newspaper, Daily Outlook Afghanistan. By hunkering down, the U.S. and Afghan governments hope to eventually bring the Taliban to the table.